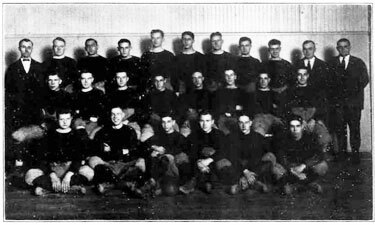 For the third season in a row, the 1923 Buffalo football team started the season with a new coach. Gone was “Dim” Batterson who won only 1 game in 1922. He was replaced by new head coach Jim Bond. 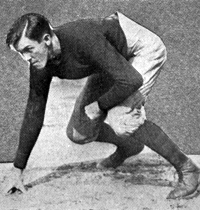 Bond was heralded as a famous gridiron hero from Pitt who was finally going to save football at Buffalo. His hire definitely was cause for excitement. In early March of 1923, Bond announced in the local papers his three key objects for the coming year. 1 – Keep the local football talent. The Buffalo high schools regularly turned out star players but almost all of them went to college at Cornell, Columbia or some other major eastern university. Bond wanted to heavily recruit these students and keep them in Buffalo. 2 – Beat Hobart & Holy Cross. A decent schedule was put together for the 1923 season and these teams we identified as the class of the lot. Defeating Hobart, an old rival, and a prominent school like Holy Cross would help make the season a success. 3 – Develop School Spirit. Attendance at football games was dismal the previous year and, without the school’s support, football would never succeed no matter who coached. Bond was given the best equipment. Rotary Field was leveled and sodded. A two week summer training camp at Angola, NY was inaugurated. Things looked bright. Enthusiasm ran even higher when in its first game Buffalo was victorious over the Rochester School of Optometry by 40 points. It seemed that a new era was opening for University of Buffalo athletics. But as the weeks wore on, things started to fall apart. Complaints of interference from certain members of the faculty and harmful meddling on the part of the alumni unit of the athletic association appeared in the newspapers. Deans and professors refused to alter class schedules. The early season hope Bond brought was short lived, as evidenced by the end-of-year scores. The team finished with 2 won, 5 lost and 1 tie. It is safe to say that Bond did not achieve any of his 3 goals he spelled out earlier in the spring. Soon after the last football game of the year, Bond resigned. (see “Jim Bond, U.B. 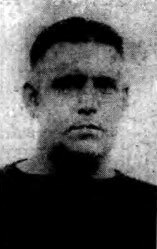 Football Coach, Resigns; Said Russ Carrick May Get Place” Buffalo Courier, 29 November 1923) Football, and athletics at the university, remained in flux. The season review below comes from the 1924 Iris Yearbook. After having passed thru the most delicate and weak stages incident to the development of its possibilities, football, as a major sport in the circle of U.B. athletics, is destined to be a notable attribute to the Greater University. While the primitive efforts in this line were fraught with many discouraging phases and replete with failures, that is, if scores can be any criterion of such, our gridiron representatives made their mark this year as that of determination and effort. Much of this resultant development is to be credited to the staunch work of the Athletic Council for the ever-increasing and constantly improving facilities. Rotary Field is second to none as an ideal football field; the clubhouse lacks nothing to make it the most up-to-date and nothing has been spared to gain one of the best coaches in this line for our pigskin warriors. The summer camp, a new idea this year, brought out twice as many aspirants as the previous year. Here these were hardened and trained and each gave an honorable record of himself. Bond’s U. B. grid men opened the season with this crushing victory. Perfect attacks and well nigh impregnable defense were outstanding features of this participation. Magavern, Metz and Vannini, more than once by their stellar plays reflected their hard and well learned training. This was on off day for the “Bolls” . In spite of the repeated efforts of Knapp and Metz, stars of this event, the strong and powerful offense and defense of the Blue and Whites ended by bowing to Thiel. Knapp, Magavem and Gimbrone, by their stellar plays, brought Chet Wallace’s proteges to a brilliant tie. There was real fighting spirit dominating all thru this game. Commendable officiating, snappy style and a fast game were more than outstanding features of this skirmish. This point victory was the result of a hard-fought, strenuous battle. In spite of the so-called fisticuffs battle the irresistible attack of the Blue and White pigskin chasers were responsible for putting the heavier side of the score under our name. Knapp played many features throughout this game. 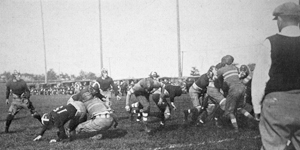 By one touchdown, Bond’s men lost this Geneva battle. Knapp and Ailinger repeatedly came to the front in this game and Vagge and Davidson completely annihilated the Hobart attack in the last period of the game. Featuring bad breaks resulted in the jolt and upset of the season as the Flower City grid men tallied over the Blue and Whites. The “Bulls” led the pace in the early stages of the game but the jinx played havoc with our ideals. With the field a miniature lake and a steady rain all thru the game both teams resorted to straight football and so the heavier team had the advantage, such was the honor of Holy Cross. Repeated fumbles of the heavy mud-covered, slippery ball prevented the “Bulls” from scoring. 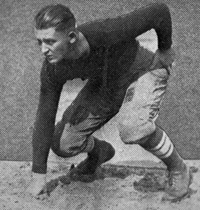 Jim Bond, former Pittsburgh star, coach of the U. B. football team, has resigned. 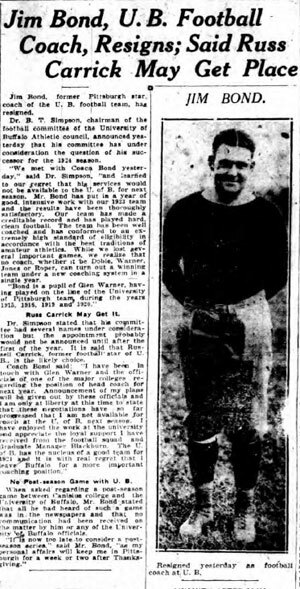 Dr. B. T. Simpson, chairman of the football committee of the University of Buffalo Athletic council, announced yesterday that his committee has under consideration the question of his successor for the 1924 season. “We met with Coach Bond yesterday,” said Dr. Simpson, “and learned to our regret that his services would not be available to the U. of B. for next season. Mr. Bond has put in a year of good, intensive work with our 1923 team and the results have been thoroughly satisfactory. Our team has made a creditable record and has played hard, clean football. The team has been well coached and has conformed to an extremely high standard of eligibility in accordance with the best traditions of amateur athletics. While we lost several important games, we realize that no coach, whether it be Dobie, Warner, Jones or Roper, can turn out a winning team under a new coaching system in a single year. Russ Carrick May Get It. Dr. Simpson stated that his committee had several names under consideration but the appointment probably would not be announced until after the first of the year. It is said that Russell Carrick, former football star of U. B., is the likely choice. No Post-season Game with U. B. When asked regarding a post-season game between Canisius college and the University of Buffalo, Mr. Bond stated that all he had beard of such a game was in the newspapers and that no communication had been received on the matter by him or any of the University of Buffalo officials.